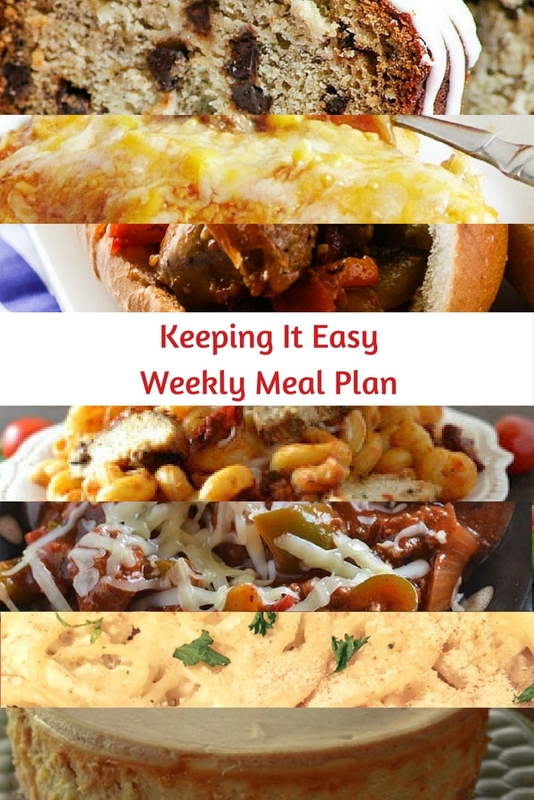 This week’s meal plan includes Banana Coconut Chocolate Colada Bread, Chicken Caprese Pasta, Slow Cooker Fajita Rice Bowls, Chicken Tetrazzini, Cheesy Beef Enchiladas, Greek-Style Sausage & Peppers Sandwich, and Apple Cheesecake with Cinnamon Shortbread Cookie Crust. It has been one heck of a week! Thanks to United States Farmers & Ranchers Alliance, I got to attend INBOUND 2017 in Boston. It was an amazing conference, packed with lots of information that I’m going to use to make this blog even better! I also got to spend some quality time with my college friends who still live around this area. We are now over 1000 miles apart, so it’s tough to see them as often as I would like. Any time I can make it back to the east coast for a visit, I jump at the chance. Attending this amazing conference and learning so many new things was just an added bonus! I’m already making plans to get back here next year. So… what’s for dinner now that I’m back home and into reality? Let’s find out! Start your day with Desserts Required’s Banana Coconut Chocolate Colada Bread. I know that this is a mouthful to say and believe me, that’s just the beginning. Check it out for a flavor packed way to start your day. Kimmi’s Dairyland has a meal that is the perfect way to begin your week. Kimmi’s Chicken Caprese Pasta is packed with sun-dried tomatoes, fresh basil and shredded mozzarella which are the icing on top of this wonderful dinner. My Fearless Kitchen’s Slow Cooker Fajita Rice Bowls are a great way of devouring all of the tastes of fajitas, with less of the mess!. Win/Win! The Crumby Kitchen has a terrific idea with her Greek-Style Sausage and Peppers Sandwich. It’s a classic sausage and peppers sandwich that is made in one pan and then taken to foreign places with the use of dill, cucumber, and Feta Cheese! I have a fabulous dessert option this week; Desserts Required’s Apple Cheesecake with Cinnamon Shortbread Cookies. The combination of baked apples and cream cheese work beautifully on the cookie crust. Say hello to Autumn!